Nabeel's Blog: ZERO: How was it discovered? The history behind the concept of zero is an interesting one. We are so used to the number zero that we cannot live without it (what if a zero is dropped from your salary and appended to your electricity bill ;). On a serious note, in the early history of counting, the number zero neither required nor well understood; and the same with the negative numbers. why? early mathematics was based on counting real things as opposed to abstract ideas. It is fascinating to see that things, like the concept of zero, we take for granted took centuries and many great minds to discover. The following time line of historical events is an indication of this fact. I hope this will be a good reminder to all of us that we will never achieve perfection and we progress through our mistakes/needs. No mistakes/needs, no progress! Version 1: Different types of goods were represented by different symbols, and multiple quantities represented by repetition. Examples: two units of grains was represented by two grain-marks. Four oil cans was as four oil-can-marks. Version 2: Separated the quantity of the good from the symbol for the good. That way a great amount of redundancy was prevented. They introduced a sexagesimal system (that is, base 60). Not sure why it's base 60 instead of any other base. Example: two units of grains as the symbol followed by the symbol of grain. Around 3000 BC - Egyptians introduced the earliest fully developed base 10 numeration system. It's not a positional number system as the decimal number system we have, but it can represent large numbers. (For example, to represent 45, they used 4 number 10 symbols and 5 number 1 symbols) Similar to Roman numerals. Egyptians also did not have the concept of zero since they also mainly thought numbers as concrete concepts for measurement of length, trading, etc. Still, I am amazed about Egyptian math; even without the concept of zero, they were able to build precisely calculated colossal pyramids and other structures. Also, through their math skill, they were one of the ancient nations who got close to calculating the correct number of days per year. 2700-2300 BC Sumerian/Akkadians invented the Abacus. They use it with their sexagesimal number system. Babylonian number system : First to introduce the place value system (just like the decimal number system we have) but still no concept of zero. Sumerian number system still needed many symbols to represent numbers. Influenced by this number system, Babylonians, towards the end of the 3rd millennium, introduced the place value system. They just needed two symbols to count. 700 - 400 BC - Use of zero to denote an empty position in the notational system. Babylonians put two wedge symbols to where we would put zero in the decimal notation. These empty wedge symbols only occurred within a number (as in 5403 in decimal); never place at the ends (as in 5430 in decimal); zero was never used as a number, but rather as a punctuation sign. During this time Greek mathematicians did not use a positional number system. They developed their theories/abstract concepts through shapes/geometry. 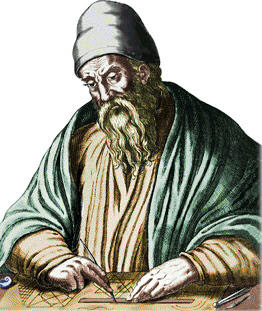 It was during this period great mathematicians like Euclid lived. Even without the concept of zero, people like Euclid worked on number theory (which lead to the fundamental theorem of arithmetic, Euclidean algorithm, etc), but it was based on geometry. However, Greek astronomers used the notation of zero and it is believed to be similar to how we currently use zero. But they did not appear to have devised a number system based on zero. 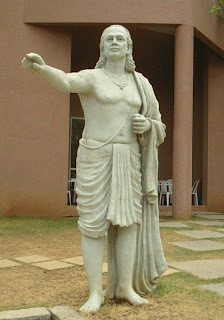 5th century - Indians (mainly Aryabhata) were the first develop a base 10 positional numeral system (remember Babylonians invented base 60 positional numeral system a long time before that) which resembles closely to our current decimal system. These dates are still disputed, but I think it's fair to credit Indians for the number system we currently have. People started to think about numbers as an abstract concept. As a result, the number zero as we use today was born. 876 AD - The first record of the Indian use of zero which is dated and agreed by all to be genuine. Indians formulated arithmetic rules involving zero and negative numbers although they did not get it right in the first few attempts. Brahmagupta, in his book "Brahmasphutasiddhanta", got most of the arithmetic operations right except the division by zero: "0/0 is 0 and a number divided by zero is that number". For many centuries after this, division by zero remained a mistry to peope; they simply did not know how to explain it. During the same time, Islamic/Arabic mathematicians, especially, Al-Khawarizmi, studied Indian number system and contributed to the arithmetics with numbers. The combined work led to the Hindu-Arabic numberal system we are using today. In 12th centure, this system was spreaded to Europe mainly through the Italian mathematician, Fibonacci. There is no doubt that the development of zero is a very important milestone in human civilization and it paved way to many new concepts. There have been many developments and rules about division by zero in the history, but let's not go into that. Currently we consider division by zero is undefined in any system that obeys the axioms of a field (e.g. real numbers, complex numbers, etc.). In the 16th century, Newton and Leibniz, fathers of calculus, played a key role in understanding "division by zero" and its applicability to real life. Instead of considering absolute values, working with numbers approaching zero, they were able to develop a new branch of Mathematics, calculus. I think this is another very important milestone on the number zero. At present, we cannot imagine Math, Physics, Chemistry or any other branch of scinece without having the value zero, yet it took many centuries to develop the idea of having a zero in the number system and people had been working with numbers well before zero came into picture. Empty sets (cardinality zero sets), zero gravity, freezing point, zero probability, accounting, modular arithmetics, calculus, Cartesian coordinate system, indexing are just name a few references. We would not have progressed this far, had the concept of zero not understood.